The Indiana workers compensation system is set up to provide benefits to workers who are injured on the job. These benefits are intended to help injured workers get medical care so they can recover and go back to work. Although the Indiana workers compensation system is in place to protect and support injured workers, certain steps must be taken – and specific deadlines have to be met – in order for claims to be approved for benefits. Clarifying the requirements of the system and how these claims work, the following provides some helpful answers to common questions about Indiana workers compensation claims and benefits. When you are ready for answers pertaining to your accident, rights and options, simply call (260) 420-8600 or email our firm. Our experienced Fort Wayne workers compensation attorneys are ready to meet with you for a free, no obligations initial consultation. During this meeting, we can provide you with the information you need to protect your claim and rights to benefits. Q: Do I qualify for workers compensation? A: Indiana law requires most employers to carry workers compensation insurance. So, if you work for an employer in Indiana and you are injured while working, you likely qualify for workers compensation, regardless of whether you are a full- or part-time employee. To off-site accidents, as long as you were “on-the-clock” when the accident happened. Q: How soon do I have to report a work accident or injury? Who do I report this to? A: It’s best to report a work accident or on-the-job injury as soon as possible. This report should be made to your supervisor or the on-site authority. If you are unable file this report immediately after the accident (because, for instance, you are transported to the emergency room), Indiana law provides 30 days for you to file an injury report with your employer. Waiting longer than 30 days to file this report can compromise a claim and result in a denial of benefits. 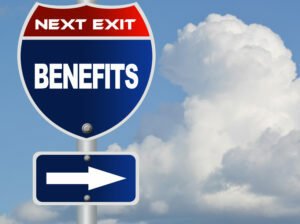 Q: How much are workers compensation benefits? A: If your work injuries prevent you from going back to work for at least seven (7) days, you will be considered to have a “temporary total disability,” and you will likely be entitled to weekly benefits. These benefits are not subject to taxes. Q: When will I start receiving benefits? A: If you qualify for workers compensation benefits and your claim is approved, your first weekly benefit payment should be sent (via mail) 15 days after the date of your accident or injury. Payment for the first week of lost wages will not be issued until you have missed 21 days of work. Q: Can I choose my own doctor for the treatment of my work injuries? A: No. In Indiana, the choice of doctor or medical provider is in the hands of the employer. This means that your employer can either choose the doctor you see or provide you with a list of pre-approved health care providers. If you feel like you are not receiving the proper diagnosis or care from the doctor you are seeing for the treatment of your work injuries, you can file an Application for adjustment of claim with the Indiana Workers Compensation Board. Q: My claim for workers compensation benefits was denied. Why? Receiving an improper diagnosis from a medical provider. If you believe your claim was wrongfully denied – or if your workers compensation benefits have been unfairly reduced or terminated, contact a lawyer at Finderson Law, LLC to find out more about your options for pursuing an appeal. If you or someone you love has been hurt in a work-related accident – or if your loved one has suffered fatal injuries in a work accident, contact a Fort Wayne workers compensation lawyer at Finderson Law, LLC by calling (260) 420-8600 or by emailing our firm. Our attorneys have dedicated more than two decades to helping injured workers protect their rights and secure the benefits they deserve. As diligent, resourceful problem solvers, we are ready to provide you with the support and representation necessary to preserve the value of your claim and help you successfully navigate the workers compensation process. Please don’t hesitate to contact us to find out more about your legal options and how our representation can make all the difference in the your claim and recovery. We’ve helped hundreds of clients. Our history of providing the superior legal services – and delivering exceptional results – has earned us a 5-star rating on Facebook.